Why Worry About the Future When You Can Wallow in the Past is my mantra for March. Please join me for the Grand Opening of “Through a Cortland Avenue Looking Glass (1898-1941)” photo exhibit this Friday, March 20 from 5:30pm to 8pm at Pinhole Coffee, 231 Cortland Avenue, corner of Bonview (nee Buena Vista). It’s been a delight to work with the Bernal Heights History Project in selecting the historic photos, and with Mullen Brothers Imaging who donated their printing, mounting and installation services. Just Added! : The World Premiere of “What Ruthie Hoarded” a 2005 video portrait of the interior of 231 Cortland made by neighbors Edward & Amy Huson that shows the former owner’s amazing collection of junk. Editor’s Note: I’ve seen that What Ruthie Hoarded video, and it is truly jaw-dropping. Don’t miss it. PHOTO: By neighbor Jack Pitts. 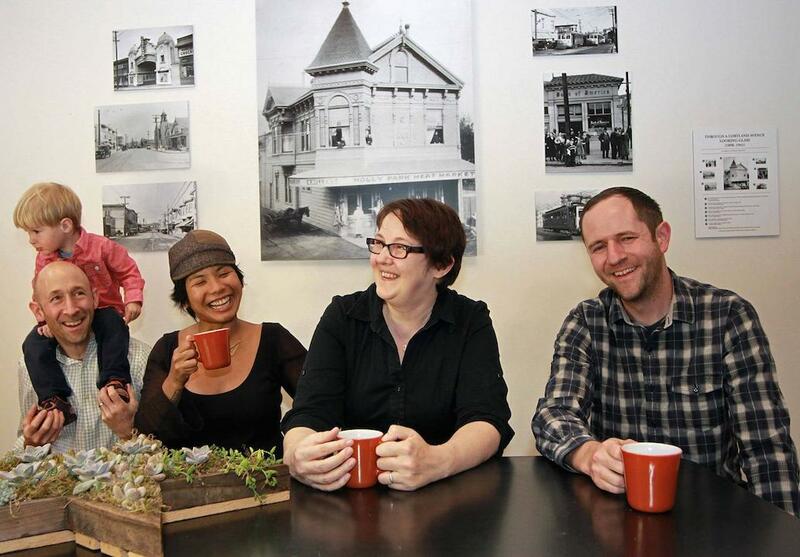 From left: Tim Mullen with son Marnix, JoEllen Depakakibo, Pinhole owner, Vicky Walker of the Bernal History Project, and Mike Mullen.